Vaidyanath Mishra, popularly known as 'Nagarjun', died on 5th November, 1998. Despite its apparent openness and transparency, the life and oeuvre of the pseudonymous Nagarjun is complex, problematic and ever fascinating. The ambiguities begin with the date of his birth, which remain unknown--bio graphical entries and blurbs, record it as 1911 and he himself supported it but, on the other hand, insisted that he was 18 or 19 in 1931 when he was tricked and inveigled into marrying his 12-year-old bride. The hostility between the loveless teenager, now a married- and-rebellious son, and his unredeemable father came to such a flashpoint that Vaidyanath left his uncomprehending child-bride in her own father's household and forsook his home and village for Varanasi, the ultimate destination of all would -be Sanskrit scholars which also had a sizeable Maithil Brahmin enclave. Thus began his wanderlust. Before he arrived in Varanasi, then the centre of Hindi language, literature and journalism--though Calcutta and Allahabad were close rivals--Vaidyanath was barely comfortable in any other language other than his mother-tongue, Maithili, a full-fledged tongue spoken and written in a small region but with close family ties with Hindi, Bengali and other neighbouring regional languages. It is not known under which poetic and emotional influences the adolescent Vaidyanath began writing poetry in Maithili, acquiring the nom-de-plume of "Vaideh", the Bodiless, but one of his first poems from his self-exile is a nostalgic paean to Mother(land) Mithila. Soon, the prolonged stay in Varanasi, coupled with journeys in the Hindi heartland and visits to the Hindi-speaking areas of Calcutta, and a near-insatiable hunger for poetry, fiction and socio-political information, available only through Hindi-- Vaidyanath hardly knew any English and would be exposed to Bengali much later--made him a bi-lingual. It is difficult to say what was greater, the force of the lingua franca or the nascent genius of the restless young poet but the year 1935 saw the publication of the first Hindi poem in the weekly Vishvabandhu from Lahore by "Vaidyanath Mishra". Under the influence of the Arya Samaj, the Hindus in Punjab were adopting Hindi and there was a literary-cultural vacuum. Next, one finds "Acharya Vaidyanath Mishra" as the editor of the Hindi monthly Dipak published from Abohar, district Ferozepur, Punjab in 1935-36. Already in double self-exile, the restless wanderer would soon impose a third upon himself. The stay in Varanasi had taken him away from Vedic ritualistic Sanskrit and mysteriously and inexplicably, placed him under the benign Sarnath gaze of the Compassionate One. Vaidyanath now craved to become a Buddhist in the company of none other than the communist-agitator-Tibetologist-Buddhologist monk Mahapandit Rahul Sankrityayan, a kindred wanderer-explorer- author. Bidding his "Last Obeisance" to the Mother Mithila in Maithili from Varanasi in November 1936, Vaidyanath, now a young man, left for Ceylon, the only true abode of Buddhism in South Asia, via Calcutta and South India. This remains the most crucial decision taken by Nagarjun in his life, as he was known thereafter, having taken the vows of a Bhikkhu in the Vidyalankar Parivena of Kelaniya. He had known enough sorrow in his youth and was only just becoming aware of its causes in Varanasi but it was in this campus in Sri Lanka that he discovered the heady brew of Buddhism mixed with socialism. Nagarjun was exposed to the writings and precepts of Marx, Lenin and Stalin. He hasn't written much about his experiences in Kelaniya and one doesn't know much of what happened to him there besides the initiation into Buddhism and Marxism but suddenly he decided to return to Bihar to join the Sonepur camp of the so-called Summer School of Politics run by his new political mentor, the redoubtable kisan leader, Swami Sahajanand Saraswati. The latter was assisted by committed Socialists, Communists and Congressmen in running politico - ideological classes for workers and activists. 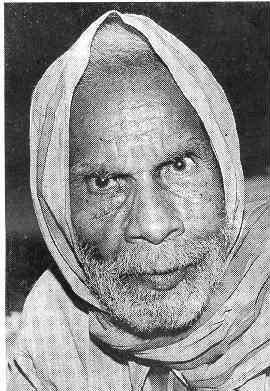 Nagarjun took part in the Ambari farmers' struggle and was arrested and jailed on 20 February 1939. Earlier, in what is perhaps his first poem in Hindi, published in 1937, he wistfully salutes all those who had died unsung, unwept and unfulfilled. The language is shorn of all ostentation, the grip of rhyme and metre is near-perfect. A new, young Hindi poet had finally arrived--one who was apparently at home with the ancient and medieval lyric traditions but was bold enough to experiment with blank and free verse as well. Nagarjun was ambidextrous in many ways. He returned to his homeland and his wife and led an intermittent conjugal life between 1941-52, the couple moving from place to place in search of livelihood and the wife compelled to return to their Tarauni base from time to time. In 1941 he published two of his longer Maithili poems, Boorh Var (The Aged Bridegroom) and Vilap (Lament) as pamphlets and sold them himself on passenger trains quite successfully. 1943 saw Nagarjun return to his interest in Tibetology and Rahul Sankrityayan. He left for Tibet, fully aware that his ailing father would not survive till he returned--neither had forgiven the other. Equally peremptorily, Nagarjun was to lose nearly all interest in practising Buddhism, Buddhology and mass movements. But he never returned to formal Hinduism and never renounced Marxism. He abhorred his father for his inhuman treatment of his wife, his sister-in-law and his own progeny and he never forgot those unfortunate creatures but he himself never settled down to a life of home and hearth, wife and children and chose to wander the length and breadth of the country, sporadically returning as a prodigal husband-and-father to Tarauni. He continued to write both in Maithili and Hindi and while only two Hindi pamphlet-poems, Shapath (Vow) and Chana Jor Garam ('Mighty' Hot Grams) were circulated in 1948 and 1952 respectively, his first, compact yet comprehensive (28 poems) Maithili collection Chitra appeared in 1949 and became perhaps the first modern classic and a standard university textbook in the language. It is a microcosm with poems on the Mithila region and Gandhi and the state-of-the-nation jostling with nature- poems, nostalgia, love and social reform and commitment. Romantic lyricism gradually surrenders to a resolute realism. The longest (169 lines) poem of the collection, Dwandwa (The Duel Within), is uniquely central to the understanding of the poet's painfully chosen way of life and his awareness of the irrevocable, dynamic dialectics of human history. It is uncannily like the testament of a modern Buddha after the renunciation, vulnerable to accusation of heartlessness, selfishness and escapism, yet resolute and unapologetic in its larger decision. If his first collection, in Maithili, was admittedly "an album", Yudhara, the first one in Hindi, was "the Stream of the Age." By 1953, the year of its publication, Nagarjun had long freed himself of his Meghaduta-Kalidasa Sanskritic lyrical romanticism, declared himself a human being and a proud athiest and wrote on the leftist rebellion in Telangana, Eisenhower, Mother India and famine. He saw Congressmen as sawdust-stuffed scarecrows, lampooned Nehru for his "pro-captalist" policies and discovered new poetic icons in Bharatendu Harishchandra and Suryakant Tripathi 'Nirala'. He is perhaps the only Hindi poet who saw and wrote about the mighty Indus during one of his wanderings in pre-Partition India. His 1O-line, 1950 poem about "the five worthy sons of Mother India" is a piece of classic satire, which he used to recite like a dancing Baul. The still shorter, 8-line poem on "The Famine and After" remains a masterpiece of tragedy and resurgence, hunger and satiety, gloom and cheer, establishing him as a major talent in Hindi poetry. Nobody seems to know and, characteristically, Nagarjun never revealed why he took to novel-writing. But the memories of his poor yet picturesque Mithila, the tradition-bound social and family-life, his own household and his traumatic childhood, adolescent rebellion, lehre-and -Wanderjahre and the experiences during his variegated Ausbildung could not perhaps find space enough even in his bi-lingual poetry and demanded expression in creative prose. Added to this artistic urge must have been the impact of the Bengali romantic-realist Saratchandra Chatterji whom Nagarjun had translated into Hindi and the ultimate compulsion--a novel still fetches much more money than several poetry collections put together. Ratinath Ki Chachi (Ratinath's Aunt)--the echo of Saratchandra in the title unmistakable but there the resemblance ends--was published in 1948. It is a novella running into 113 pages--Nagarjun never had the time, patience and ambition to write a full-scale novel--but remains till date one of the most realistic--and feminist--novels in Hindi. Uninhibitedly autobiographical, the young protagonist, Ratinath, is none other than Vaidyanath and the eponymous aunt is his hapless widowed aunt who had to abort his father's illegitimate child, leading to her social and spiritual ruin. Even Jainendra Kumar, the first male feminist Hindi novelist, could not touch the stark, non- prurient, deeply moving realism of Nagarjun's Ratinath. The theme is still so taboo that the academic guardians of curricular morality have firmly outlawed it from university syllabi. But the novel is not only about adulterous carnality and foeticide, it is a rich conjuring - up of Maithil society, culture and ecology, interspersed with irony and humour so characteristic of the region. That world of Mithila may not exist any more but in Ratinath Ki Chachi lives forever. Balchanma his second novella in Hindi, was published as a book in 1952. This, again, is perhaps the first piece of fiction of its kind in Hindi--a first-person account of the life of the eponymous protagonist, a teenage backward Yadav bonded labourer. A harrowing tale of abject poverty and naked exploitation, it promises liberation to such rebellious youngster as Balchanma only to end in his brutal murder by the mercenaries hired by the upper-caste kulaks and landowners. Varun ke Bete (The Sons of the Water-God Varuna), written in 1954 and published in 1956, is yet another unconventional work. It is a story of the (low-caste) village fishermen fighting for their fishing rights and trying to form a fishermen's cooperative. Nagarjun wrote 13 novels, 11 in Hindi and two in Maithili, and each of them centres around a socio-economic-political theme, making him one of the most 'programmatic' novelists in Indian literature. His stories are invariably set in rural or semi-urban Bihar and tell the story of the downtrodden and the exploited, amongst them women and children. Quite unselfconsciously, Nagarjun became the precursor of the so-called Annchalik Upanyas--the Regional Novel--in Hindi, preceding Maila Annchal, the path-breaking classic written by the fellow- regional Phanishwarnath 'Renu' in 1954, by six years. It is impossible to separate Nagarjun from Bihar--it pervades his poetry and fiction and is indeed the nest to which the aging falcon returned after each short or wide gyre. His Hindi has just the right kind of Bihar flavour to it and his poems are replete with the geography, culture and politics of Bihar. This would be natural in his Maithil oeuvre but it is in Hindi that Nagarjun introduces and establishes the people's Bihar for the first time closely followed by 'Renu' and, later, by many other younger talents. Ramdhari Singh 'Dinkar,' Nagarjun's senior from Bihar, was cast in a pan-Indian, high-culture, patriotic mould and flattered himself with the sobriquet 'Rashtrakavi'--the National Poet--but fellow-poets and millions of his admirers affectionately called Nagarjun 'Janakavi'--the People's Poet. Though there are poems in which he remembers his wife and children, poems of friendships and surrogate family ties, of travel and nature, Nagarjun remains predominantly a poet of politics and people, of the peasantry and of the proletariat. He was angrier than any angry young poet but also possessed a typically robust Maithil-Bihari sense of humour and savage satire. In his last published collection of Hindi poems Apne Khet mein... (In My Own Field, 1997), he comes out with such personal poems as Na Sahi (If Not So What) and Aur Phir Dhikai Nahin Di (And She Was Not Seen Again) but also lampoons the Madhuri-crazy M.F. Husain and the tall-talking Laloo Yadav. Hua Gittiyon Men Ras ka Sanchar (Sap Ran Down the Ballast) is a harshly moving poem on the de-humanized rickshaw pullers of Calcutta but in ironically, Sanskritized language and metre, reestablishing him as the committed 'il miglior fabbro' of Indian poetry. But there is nothing Poundian about him; he can be compared only to Walt Whitman abroad and Kabir nearer home. Though he was a card-holder decades ago, Nagarjun soon realised that allegiance even to the Communist Party was a curbing factor to a committed artist, whose first obligation was to the people. Hair-splitting party diktats ill-suited his leftist yet free spirit. He remained popular among all shades of Communists, Socialists and even radical Congressmen. The popular movement led by Jaiprakash Narayan so fired his spirits in 1974 that he joined the "reaction-led" upsurge and was jailed on 1 June 1975, before the Emergency was imposed by Indira Gandhi, and was released only when a habeas corpus application was moved in the Patna High Court on 26 March 1976. Interaction with fellow-prisoners, especially those belonging to the RSS and Jan Sangh, left him totally disillusioned with JP's proposed "total revolution". He didn't stop writing anti-Indira poems, but added anti JP-movement poems to them. He continued to embarrass many of his admirers by such free-thinking volte-face. When he accepted the Uttar Pradesh government's Bharat Bharati Award for his literary contribution from Prime Minister Indira Gandhi in 1983, the smiles the two exchanged were full of mutual irony. Much earlier, in 1968, he accepted the Sahitya Akademi award for his collection of poems Patraheer Nagna Gaachh (The Leaf- denuded Tree) in the newly-recognised language Maithili, largely due to the friendly manipulations and persuasion by an old crony, Prabhakar Machwe, who was then the deputy secretary administering the prestigious awards in the August literary institution. This deprived him of the Akademi Award in Hindi but Machwe knew that with the kind of poems Nagarjun was writing in Hindi he stood no chance of getting that in the near future. This second collection in Maithili is not without its anti- orthodoxy, anti-establishment barbs but it is certainly true that after he discovered it as a vehicle of literary expression, it was only to Hindi that he gave his creative and rebellious best. Both in Maithili and Hindi he is better-known as a poet than a novelist, though one can ignore his novels only at one's peril; while at the national level he is more recognised as Hindi poet than a Maithili one, but his assessment as a poet remains flawed if his Maithili poems are ignored. He wrote in Sanskrit as well, more as Kavya-kautuk, poetic sport, but his Bengali poems, far less numerous than his Hindi-Maithili output, are significant all the same and not merely for his amazing felicity in the language but for their poetic content as well. There are some unique poems in the Bengali-Hindi collection Mein Militri Ka Burha Ghora (I, an Old Cavalry Horse, 1997) which are sensual, pensive, lyrical and ironical--products of a strange burst of creativity in Bengali during the 17 months between February 1978 and September 1979, whose ultimate judge can only be a native Bengali reader of poetry, though they sound extraordinary in Hindi translation. For the last 30 years at least, Nagarjun has been the most popular, loved and respected senior poet for the younger poets. His moral and poetic influence is discernible in the works of Kunwar Narain to Katyayani. Along with Gajanan Madhav Muktibodh and Raghuvir Sahay, it is Nagarjun, older than the two, who inspires the young poets in Hindi today the most; yet he remains a difficult poet to emulate, for few can ever hope for his vast experiences with people, his deep human sympathy, the deceptive simplicity of his language and complete mastery over the poetic craft. His output is awe-inspiring---6 poem-pamphlets and 14 collections in Hindi along with a pot-boiling textbook Khandakavya, 2 poem-pamphlets, 2 collections and 2 bi-lingual collections in Maithili and one bi-lingual collection of Bengali poems. A small Sanskrit collection also lurks somewhere and scores of poems lie scattered in periodicals and notebooks and manuscripts. During his travels spread over more than 60 years, Nagarjun visited scores of places all over India and made thousands of writer and non-writer friends. They became his surrogate family, though he fathered six children in Tarauni, visiting his wife from time to time. This long-suffering woman, Aparajita, who really lived up to her name, the unvanquished, raised her children single-handedly, educating them, getting them married and settled in life while Nagarjun would intermittently appear as an uninvolved guest--as a Yatri as he liked to call himself--with some money and gifts only to re-embark on his journeys to distant towns and cities where devoted, affectionate individuals and families would greet him with the appellation "Baba", the mendicant father-figure. Whether this was on account of his being a Buddhist Monk--"Baba" being a natural suffix to "Naga"--or whether it was attributed to his sadhu-like untrimmed beard and greying hair, is not clear, but he soon came to be universally accepted and addressed as a grand-father who united the family of authors and non-literary families in shared, collective affection. Ironically, this has had a deleterious effect on his reception as a poet. No major professionally-run publishing house accepted his poetry before 1980, though he had made his reputation as a poet much before that, and he is now not read and respected as a poet but is loved and revered as "Baba'. Thus, most of the 10 collections and the three volumes of his selected works in Hindi, one bilingual Maithili- Hindi collection and the sole bilingual Bengali-Hindi collection, all published after 1980, have gone largely unread and unreviewed. While the publishers are happy that the very name Nagarjun now sells, most Hindi poets and critics hardly read him for he is already a 'modern classic' and a "Baba", the great parent-persona, beyond all analysis and critical appraisal, fit only for sainthood, deification and adoration. Everybody has a real or imaginary personal reminiscence, anecdote or memory of "Baba", hardly anyone has seen his recent collections. Those of his novels that are easily available are largely neglected, which is something of a pity, for Nagarjun, along with 'Nirala', Muktibodh and Raghuvir Sahay, remains a poet whose significance seems to grow with each passing day. Bihar is India and India is Bihar and the poems of Nagarjun mirror and critique the exasperating contradictions, daunting challenges, perpetual tragedy and sundry triumphs of this synonymous duality. His poetry and fiction are polyphonic; they have more than one sub-text and can be read as subaltern sociology and history but there is nothing subordinate about them--they belong to the real, dominant mainstream of Hindi literature. On the other hand, he is at core a vulnerable individual, with love, yearning, guilt and tenderness, tormenting and ennobling his soul. Its inner demons turned him into a tireless traveller--he was no profligate philanderer. His widow and children and thousands of admirers forgave him his trespasses. To those who read him, he is a deeply committed humanist with a rare mastery over language(s), style and craft. Now that the canonised and mobbed "Baba" is gone, one hopes that his devotees will turn to his works where he lives as the ever- readable, relevant and breathless Nagarjun.